Check Your State Requirements - Many states have made CPR a curriculum requirement. These laws vary in the context and extent of the training necessary. The Student CPR certification-level implementation currently meets and exceeds all known state requirements. Alternatively, schools can typically meet those requirements with a specialized awareness-level implementation. Choose your Course Level - Considering your state requirements, resources, and learning goals, decide if you will be completing an awareness-level or certification-level program. Also, determine who will be involved in training the students. Organizations can choose to upgrade the certification program to a more advanced course that includes first aid or healthcare provider-level skills. Register your School - Register by filling out the online registration form. We will then send dashboard access to each educator and any administrators who need oversight through a username and password that can be used to log into the Student CPR website. Training on using the website is given during an orientation course. After registration, educators receive an online Dashboard that allows them to create digital classrooms, each with different class codes. Example: You create a class called "6th Hour Fall 11". It has a corresponding class code "SCH-353-43-382." Teachers pass out the class code (SCH-353-43-382) to the students in that particular classroom. The students register themselves on the homepage, www.studentcpr.com. Students must complete the training and pass the final test with a score of 80% or better. If teaching the certification program, the hands-on evaluation is held by a certified skill evaluator after the students have completed the online test. The evaluator will use the scenario testing sheet and test the students' skills on the manikin. Note: Awareness-level programs with a hands-on element do not require a certified evaluator or the skills sheet. After assessing the students, the educator will mark students as passed in the dashboard and order card stock. After passing the skills test, the students will receive a card corresponding to their CPR course (students receive a completion card for the awareness-level course and a certification card for the Community CPR course). Skill Evaluators specialize in assessing hands-on skills following an online component. With the increasing popularity of blended training, the need for skill evaluators continues to grow. Student CPR evaluators are trained to administer a wide variety of CPR & First Aid evaluations. This allows them to evaluate and certify students, school staff, and local professionals in conjunction with ProTrainings online courses. Learn more about our advanced staff & training courses. ProTrainings recognizes current CPR instructor credentials. Simply send credentials from another national training provider (such as American Heart or Red Cross) via email (support@protrainings.com) or fax (616-328-5118). If a teacher is not a current instructor, they will need to be trained as a skill evaluator by ProTrainings. Skill evaluator training is a blended course and will take approximately six hours (or less, depending on the student's knowledge of CPR). Future evaluators first take two online courses available to them in their dashboard. These courses can be stopped and restarted as needed and completed from anywhere with an internet connection. 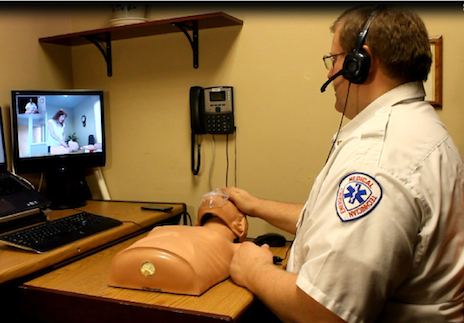 Upon completing the two courses, future evaluators must complete a hands-on demonstration via video conference. These conferences require manikin equipment; a two-hour block of time; and a computer with a camera, speakers, microphone, and an internet connection. For large groups, Step 2 of the skill evaluator training can also be completed in person, at your location, by a ProTrainings instructor trainer. Contact us for more details.